Health experts working in Malawi now have the capability to take on more complex life-saving procedures, thanks to a donation of two anaesthetic machines from St Helier Hospital. Senior nursing staff at Epsom and St Helier hospitals are sporting bright new uniforms that help make them more recognisable to patients and visitors. 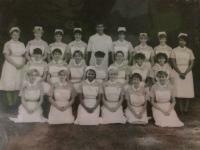 Thirty years to the day since they first started their training together, a group of nurses recently met up to visit the hospital where they trained and take a trip down memory lane – or Wrythe Lane at least.